2. You may forward this message to your co-authors or colleagues in order for them to access the paper also, but do remember that access is restricted to a TOTAL of 20 PDF downloads (unless you otherwise have subscription access to the content). Non-subscribers may purchase additional downloads on a pay-per-view basis. I think, and I hope you will all agree with me, that the idea of providing a finite number of “electronic reprints” is profoundly misguided and patently unenforcible. But let’s skip blithely around that and focus on the core issue. In general, I find it iniquitous that when authors freely contribute their work to journals and books — especially books as spectacularly expensive as the Dinosaur History volume — the publishers try to restrict those authors’ rights to give copies of their own work to their friends and colleagues. It’s just wrong. It should be enough that we allow them to publish and sell our work for no fee; that they should then limit what we do with it is — well, I hate to repeat myself, but I can’t think of a better word than: wrong. Publishers can pull this kind of stunt because they own the work. In short, they can do what the hell they want with it. And the reason they own the work is because we blindly hand over copyright to them. We’ve been doing it for years; decades for those of us who’ve been in the game longer. I know I’ve mentioned this before [Choosing a Journal, Time for the Revolution] but there really is no justification at all for publishers to require authors to sign copyright over to them — yet this practice remains ubiquitous. And there is no justification for us to keep on rolling over and giving them what they want — yet we do. Well, they don’t have this one! (b) The copyright holder hereby grants the Geological Society of London permission to publish the said contribution in paper, electronic, and facsimile formats, and for electronic capture, reproduction, and licensing in all formats, in whole or in part, now and in perpetuity, in the original and all derivative works and also grants non-exclusive rights to deal with requests from third parties in the manner specified in paragraphs 2 and 4 below. And filled in section 3 of the form instead of section 2. 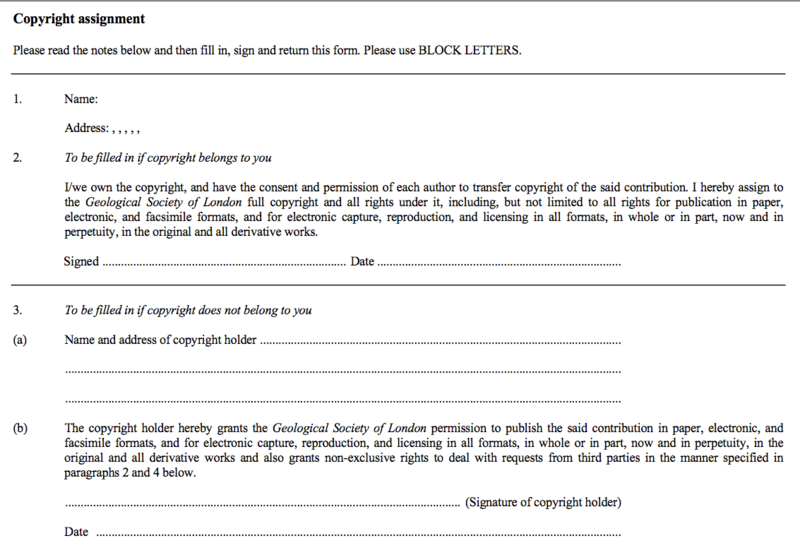 Of course, there is no earthly reason why they shouldn’t offer copyright-holding authors the option of just giving the Geological Society the rights it actually needs, but since they don’t do that I was happy to take advantage of the loophole. Well, no, actually. For two reasons. First, the really extraordinary thing about this is that the published version of my paper includes the copyright statement above, at the bottom of the first page, asserting that the work is copyright the Geological Society of London even though I carefully took explicit steps to ensure that this is not the case. How did that happen? I can only assume that the Society, like other publishers, is so used to everyone just blindly signing away copyright that they used their standard boilerplate without even bothering to look at the form I returned to them. That speaks all sort of bad things. The world has become a twisted place. I can see three ways we can avoid giving publishers total ownership of our work. 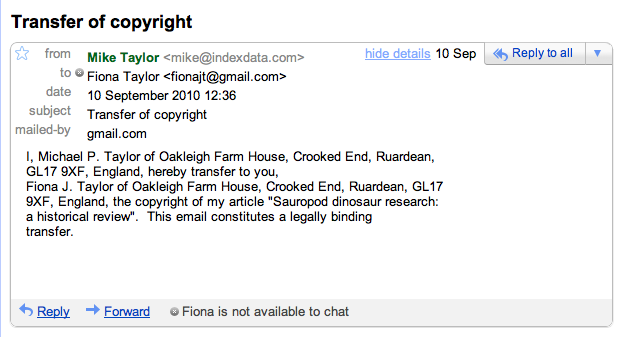 Simply don’t submit to journals that require copyright transfer. Most do, but not all. Among the honorable exceptions are the PLoS journals, and Zoologica Scripta. If any of you know of others, please shout in the comments. Just refuse. Publishers know they don’t need copyright, and there is an established form for withholding it: the SPARC Addendum. I’ve not used that before, but it’s time I started. We must have been mad to have handed over all our stuff for all these years. What the heck were we thinking? Time to start taking it back — so we can give it to the world. After all, the main reason I want to retain my copyright is so that the publisher can’t require me not to post the PDF freely on my own website, and I am sure the same is true of 99% of scientists who want to retain their copyright. Publishers must not be allowed to be a barrier to the dissemination of science! You should know that the false designation of copyright ownership is a crime. Simply saying they own the copyright can get them fined up to $2,500 per instance. See 17 U.S.C. Seciton 506(c). The people who enforce that are the same ones that are claimed to enforce copyright violations at the beginning of every DVD you rent. You should let them know that the FBI will come knocking unless they recover every copy and delete the notice on your work. DK Fennel, thanks for the correction — I fixed the relevant wording in the article. I didn’t know that false copyright claims were a crime (though note that you’re citing American law, and I like the Geological Society am Britsh.) I suppose I am not surprised given the huge mountains of litigation that surround everything to do with copyright. But I certainly wouldn’t ever want to be in bed with the people responsible for those contemptible time-wasting “you wouldn’t steal a car” adverts that our player forces us to sit through without skipping on Every. Single. DVD that we buy. Mike, we have similar DVD warnings over here, but they’re very big, boring walls of text warning us of the criminal consequences of copying and/or selling this DVD that you’re about to watch. Ofte, this warning shows up twice–once in English, once in Spanish. On occassion, it will also appear in French. Happily, many DVD’s will let you skip ahead past these screens. Also, “You wouldn’t steal a car?” How passive-aggressive is that? We software engineers only hand over copyright of our work for obscene amounts of money. When we work gratis, we just publish at sourceforge or somewhere and set up whatever license we choose depending on our goals and priorities. I realize academic publishing is different, but what would be so wrong about publishing papers at miketaylor.com or whatever? You have to find peer reviewers and do your own editing anyway, right? What is the point of this? Can you help us laymen understand what is going on here? wrt DVDs, if you are watching the car stealing sermon every time you watch your movie, you are doing it wrong. I always wonder what actual car thieves think during those warning sermons. ech, yes — when a publisher is paying an author for a work, then signing over copyright is on the table. It’s one of the things that a publisher might legitimately request, and which the author and publisher can negotiate over. Typically, when the copyright is sold, the author is paid more than if a licence to publish is given but copyright retained. That is all well and good. Academic publishing is different, as you’ve noted, in that we (A) habitually hand over copyright and (B) don’t get paid by the publisher. Astonishingly, in many cases, we pay the publisher to take away our copyright. The publisher then sells subscriptions to journals consisting of our work, often at unaffordably and unjustifiably high rates. Once more, as I always do after expounding this convention, I find myself asking: why? I know it’s not a new question, but I am still struggling to think of anything approaching a rational explanation. And no-one else has given me one, either. In the case of the Journal of Vertebrate Paleontology, you could make a case that we do it to support the Society, which benefits from JVP subscriptions. But for commercially published journals such as Elsevier’s Cretaceous Research, I really don’t see how the standard arrangement benefits anyone except Elsevier. What would be so wrong about publishing papers at miketaylor.com or whatever? You have to find peer reviewers and do your own editing anyway, right? What is the point of this? Can you help us laymen understand what is going on here? No, academic authors do not find their own peer reviewers and do their own editing — not outside of New Mexico, anyway. That would hugely compromise the objectivity of the process. Publishing in recognised journals and going through peer-review entails having your manuscript handled by a disinterested editor (though hopefully not an uninterested one) who will select peer-reviewers and assess their comments. (Typically the author is invited to suggest a few candidate reviewers, but editors are under no obligation to follow those suggestions, and I have heard it said of at least one editor that he habitually excludes reviewers nominated by authors.) The benefit of this is twofold: first, and most important, it provides a safeguard against inadvertently publishing nonsense. Nearly everyone who’s been through peer-review admits that, however painful the process, it improved the quality of the final paper; and when there is no peer review, you get things like the Amphicoelias dystophaeodocotrachelopan paper. The second benefit of going through a proper journal instead of self-publishing is that your work is, rightly, afforded more credibility by other academics, who understand the process. So, yes, I could skip the painful (and painfully slow) process of editing/peer-review, and publish my papers right here on SV-POW!. So long as I printed off 50 hardcopies of each such paper and made them available by mail-order, those papers would even be considered as published by the ICZN, so that I could raise new names in them. But such papers would rightly be regarded with suspicion by the academic community. It’s better to put in the extra effort, and invest the extra time, to do it properly. One of the reasons that the scientific community continues to publish in journals which a) cost lots of money (I pay $120 per page to publish) and b) take copyright of the material is …. jobs. When one is judging candidates for a position, and one has 100 applicants, one sometimes turns to very simple methods to winnow the 100 down to, say, 5 or 10. And one very simple method is to ask “How many papers has each applicant published in Prestigious Journal A or Prestigious Journal B?” In many job decisions, one paper published in, say, Nature, will sway the voters because Nature is _such_ an important journal (rolls eyes). It’s fast, it’s easy, and most of all, it’s traditional. As long as jobs are decided by which Prestigious Journals have published your papers, you’ll continue to do whatever Prestigious Journals demand. How long will it take to change the atmosphere and conventions of the hiring process? Probably one generation, some 20-40 years. We have to wait for all the people who are set in their ways to retire or die. Not really joking. Mike Taylor – Thanks; that is enlightening, I thought the legwork of finding reviewers was sort of the job of the author, I guess I was totally wrong about that. I certainly wasn’t suggesting that the process be skipped. Amphicoelias dystophaeodocotrachelopan – zing! But it is sort of a good example of what I was talking about; if the authors had found a respectable list of reviewers and also published the feedback in some way, would the reaction have been that the list of reviewers itself was not objective because it was not created by a journal editor even if it appeared to be a good list? I think that had the brontodiplodocus authors arranged to have their paper peer-reviewed, then that would have slightly helped to get it taken more seriously — but their having done this themselves rather than having an objective editor do it would hurt them badly. More importantly, if they’d solicited reviews from competent, experienced people (and if those people were prepared to invest the effort of reviewing properly despite the fact that the paper is about privately owned specimens and is not destined for a journal) then those reviewers would likely have saved the authors from some of the errors they perpetrated. I am not a lawyer, but I would guess that the “copyright” statement is boilerplate on all articles, and they’re assuming that the authors aren’t going to sue them. Personally, if I was asked to sign something away, I’d scribble “this is not my legal signature.” If they bugged me about distributing a pdf, I’d ask why they assumed they owned the copyright. But that is a tad reckless…. A while ago, I looked up the annual revenues, and if I recall correctly, [PUBLISHER] made about 10 times the revenue of the fiction romance publisher Harlequin. Why? In part, because Harlequin pays their authors. I can guess who has a bigger readership. With scientific research, someone else pays for the science, the author or the institution pays for the publication, the journal sells the articles, subscriptions, even advertising within the journals. Much of the editorial and review labor is donated. Here’s the question: where does all that money and labor go? Into [PUBLISHER]’s profits. I’d add that in the fiction-writing industry, paying someone to publish your work is called vanity publishing, and it’s frowned upon by working writers who want to earn a living from their words. Now, speaking as a former academic who still pays taxes, my question is not “is this right?” It’s “why should the public (e.g. me) pay for large-scale vanity publishers?” And furthermore, why aren’t more scientists asking this question? –Learn whose money you’re using to publish. –Learn where that money goes, and determine whether this is a worthwhile expenditure of scarce grant money. –Learn as much as possible about the academic publishing business. One of the common fiction writer’s complaints is “I don’t want to deal with money and copyright, I just want to write!” Considering that the fiction industry is in crisis, wise older writers are urging us young’uns to get as business savvy as possible, as quickly as possible. I’d suggest that young scientists do the same. Another excellent post, though I’m appalled the society still claimed copyright of your paper even after you indicated somebody else owned it. ech’s idea is something I was pondering after your last post. Our community is pretty small and we all know each other or have at least heard of each other. There are what… 30 people qualified to review a sauropod paper, and another 30 (with a bit of overlap) qualified to review a theropod one. It would seem pretty easy to set up a website for sauropod papers, get all 30 people as members, then have some review process between them. Members upload manuscripts to a database, download manuscripts to review them, etc.. Since the members are spread across the globe and often work at universities, it would be a simple matter to assign duties to print out hard copies for nomenclatural papers (until the ICZN allows electronic copies). Non-members would be allowed to upload their manuscripts, but not download others to review. Not everyone has to join of course, but if they do they get free publication, copyright retention, and they have their paper in a well known venue that enables free downloads. Mickey, what you’re describing sounds good, but how is it better than just submitting to an open-access journal? PLoS still looks like the best bet to me, but other good options include Acta Pal. Pol. Because my idea has ensured quality peer review, while PLoS ONE is as bad as standard journals in that regard. Look at Darwinius or that recent paper explaining “a possible hydrodynamic explanation for Moses crossing the Red Sea”. You can never guarantee quality peer-review, only encourage it. I’d say that the PLoS journals are as good as any on that count. Having been burned by Darwinius, you can be sure that they won’t be suckered into doing the same thing again — in fact, it’s an open secret that since then they have dumped what would have been a high-profile paper precisely because the author was putting on pressure to get it out in time for a pre-scheduled press-fest. Richard Stallman (look him up if you don’t know who he is) once mused about a new publishing model for scientists: http://www.nature.com/nature/debates/e-access/Articles/stallman.html . http://arxiv.org “is a highly-automated electronic archive and distribution server for research articles”. It appears to be run by Cornell University in the US. It explicitly does not do peer review, but it does use volunteer peers who ‘endorse’ submission, by which mean check to see if papers adhere to minimal scientific standards. Are you obligated to publish in the journal first? If not, you might consider to first publish your paper under a liberal license somewhere else, and only then submit it to the journal. You’ll still lose your copyright, but at least retain as much control as the original license allows you. I was also going to mention ‘open access’, but see you are already familiar with the phenomenon. Thanks for that, Branco. I am computer programmer in my day-job, and I know very well of Stallman — Emacs has been my editor of choice since 1987! The simple truth of free software, or open source as everyone calls it now, is that it just wouldn’t exist in anything like the form we know it if it weren’t for Stallman: there would be no Linux, OpenOffice, Gnome or GIMP — not to mention the programs he actually wrote, incuding GCC, GDB and Emacs. So, yes, he’s one of my heroes for both technical and activist reasons. One theory that I’ve come across as to why the academic convention is to hand over copyright gratis to the publisher is this: convenience. Back in the good old days, when copyright was still retained with the author and Google didn’t exist, it would be really hard to track some authors down for the permission to reproduce work, because they had practically vanished off the face of the earth: followed a different career, became a recluse in the Pyrenees, died, etc. The solution is to assign copyright to the publishers so that they become the point of contact for clearing copyright permissions. There are advantages to this arrangement. Publishers are corporations that tend to stick around a lot longer than people, and even if they get swallowed up by some MNC, the rights get passed on to the next guy. Another “advantage” is that academics don’t have to clear those permissions themselves (although you could assign that task to the publishers anyway). In any case, one further reason I can see for this arrangement to take root is that the lay perception (as opposed to the legal reality) of copyright is that it is retained so authors can profit from the royalties. Since academic authors do not already receive royalties, the logic goes, why keep something so vulgarly materialistic as copyright? Of course, now we see what terrors this tradition has wrought. None of the reasons I’ve mentioned above need apply any more. Authors can retain copyright and grant a license to the publishers to disseminate their work AND clear copyright permissions. That’s exactly how I read the history, too. We have an awful lot of traditions in academic publishing that used to make sense back in the 1980s, or in some cases the 1880s, but which don’t make sense any more.